FAI is re-sampling private water-supply wells quarterly based on well use, concentration, and location. 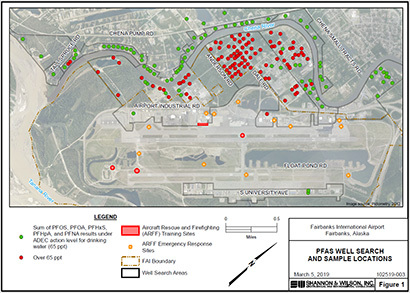 Fairbanks International Airport (FAI) was alerted in late October 2017 to concentrations of Per- and Polyfluoroalkyl Substances (PFAS) in the groundwater at the Aircraft Rescue and Firefighting (ARFF) Training Areas. The PFAS discovered in the groundwater at the ARFF Training Areas were in concentrations higher than the U.S. Environmental Protection Agency’s (EPA’s) health advisory levels. FAI is working with an environmental consulting firm, Shannon & Wilson, Inc., and the Alaska Department of Environmental Conservation (DEC) to identify and sample private water wells west of the airport beginning Monday, Nov. 13, 2017. On Aug. 21, 2018, DEC established guidance for the State of Alaska that groups five similar compounds into a combined PFAS action level to be compared to the EPA lifetime health advisory level of 70 parts per trillion (ppt). The EPA lifetime health advisory level included just two compounds, PFOS and PFOA. As of Nov. 30, 2018 FAI has sampled 193 wells with 102 wells above the DEC Action Level. FAI’s priority has been to identify and provide safe drinking water to impacted properties. FAI is providing alternative drinking water to homes with PFAS levels over 65 ppt that haven’t been connected to a municipal water source. As of October 2018, FAI has connected 61 properties to College Utilities and is currently scoping a project for the connection of the remaining properties in sampling areas 1-4. Construction will commence Spring of 2019. In order to track PFAS movement in groundwater, DEC requires continued quarterly monitoring of wells with sample results above 35 ppt and annual monitoring of wells with sample results above 17.5 ppt. FAI has contracted water delivery services through Vision Construction Intl. LLC. Residents and businesses in sampling areas can call 479-0380 to set up an alternate drinking source. In the event residents or businesses require drinking-water prior to their scheduled delivery they can call the Fairbanks International Airport Communications Center at 474-2530 to arrange a water pick-up at the Airport Response Center located at 5195 Brumbaugh Blvd. Note: If you have trouble viewing any of the above documents, please contact us for an alternative option.